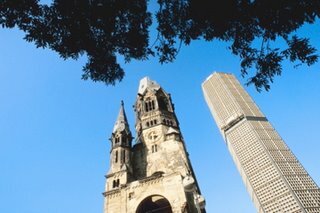 Enjoy - Food & Travel: Berlin - eine Reise wert! I visited Berlin in mid July. Until now, I have really not been very tempted to visit the German capital. Do not ask me why? May be I have lived with the misconception that it still lived in the past. What ever reason, I could not have been more wrong! Berlin was wonderful, surprising, avant-garde, stalinist, ultra modern, ethnic, and very, very hot! I travelled with some friends. Norwegian Air Shuttle, roundtrip from Oslo - around €180 incl tax brought us to Berlin Schönefeld, the old East German airport. Surprisingly small, but well connected to the extensive public tranportation service. 45 minutes from the country side to our destination. Alcatraz Hostel situated by the Eberswalder Strasse subway station in the Prenzlauer Berg area. My friends had arrived a day earlier. The fact that they had booked a hostel made me slightly worried. Being 45 years of age, I have not lived in a hostel for 25 years. My recollections from my hostel-life are large dormitories and overcrowded bathroom-facilities. Another fact that made me worried was that they had only paid €200 for four - for four nights (!). I'd gladly pay the same sum for a double room for one night. To be quite frank - my fears were totally unfounded. The two first nights we stayed in a spacious flat on the upper floor, and it was was great, but being at the top, made us aware that the heat in summer rise to the top of any building. Not very pleasant with daytime temperatures close to 35C (90F) and lows of 20C (70F) - and no airconditioning! The last two nights we stayed in two double room one of the lower floors. That was a cooler experience. I highly recommend the Alcatraz if you want to get a budget room, but do try to get one of double rooms with shared bathroom. They had been renovated and were close to ordinary hotel standard. Eating and drinking in Berlin is ridiculously inexpensive, by Scandinavian standards. In the Prenzlauer Berg, there are great number of nice restaurants and bars, and as there were no breakfast served at the hostel, we looked around in the neigbourhood and found a great breakfast buffet at a very low price. A very good food memory is from the Happy Duck in Fuggerstrasse 20 in the Schöneberg area. For those of you on a low budget - this is the place, much food at a low cost. They serve great chinese food in abundance. We tried one of their menus, consisting of various fish, poultry, and meat dishes. We were totally stuffed and a little drunk as we left, and the cost was around €10 a person, including drinks. We particularly fell in love with the bars and bistros of another area - Kreutzberg, with its old houses and it hip, alternative crowd. On our last warm summer-evening we ended up in a restaurant on Potzdamer platz. We ate an entree, a main course (I chose a wienerschnitzel the size of Wannsee), dessert and wine paying around €25 each. If you would like to take a walk on the wild side, visit das Bezekammer. A hole-in-the-wall gay bar hidden under the railway bridge enterring Alexanderplatz railwaystation. This is a place where you can, if you manage to squeeze in, listen to German music from the last four decades. The clientel is very far off the chic crowd of Kurfürstendamm or Schönberg, but das Bezekammer is dead charming. I would love to enter this charming little bar during winter for a cold draught beer. But I'm sorry - they have no draught beer. only bottles. If you visit during summer you can go to the beach. The Wannsee beach was the playground of the West-Berlin islanders during the cold war. They have a regular beach, and - if you want to explore your exhibtionist sides, a nudist beach. The water was very warm (close to 28C), and due to the bioproduction, looked a little dirty. This should not concern the health-conscentious swimmer, though. Large informations boards ensured us all that the water was as safe as the water out of our own tap. And if you travel in Berlin in July (and I mean whether you are straight or gay) - go and watch the Christopher Street Parade, a sparkling, glitzy gay parade from Kurfürstendamm or beyond to Tiergarten. It is great fun and this year 400 000 of us ended up on a gigantic street party. So - Berlin ist eine Reise Wert! Thank you! I will explore your web later. Berlin is however a great place to stay. Berlin indeed is a beautyful city. I visited it three times and it was always fun. Anyway, you should take a look at Hamburg, too. The nightlife at St. Pauli Reeperbahn is awesome!